For the people who missed the last “Fab Phones Fest” Sale, Amazon India has again brought it. The sale will begin from 11th April and will continue till 13th April. In this three days sale, Amazon promises to give heavy discounts and offers on the different smartphones along with the mobile accessories. The e-commerce website already started teasing the biggest offers that will be given during the sale. Check out the discounts on the smartphones Amazon is giving. Amazon promises to give the 'lowest price ever' offer on the OnePlus 6T during the “Fab Phones Fest” Sale. The e-commerce website claims that the OnePlus 6T will get the 'biggest ever offer' till date on 11th April. The smartphone will come with the price cut down at Rs 33,499 while the original price is Rs 37,999. The offer also includes a Rs 1,500 discounts for the HDFC Bank cards users. The OnePlu 6T comes in three variants and during the sale, the 6GB of RAM and 128GB of storage variant will get a flat Rs. 3,000 discount. On the other hand, the 8GB of RAM and 128GB of onboard storage and 8GB of RAM and 256GB of storage variants will receive a flat Rs. 4,000 discount. During the three days sale, the iPhone X of Apple will also get the price cut which has not been disclosed yet. Along with the price cut, the smartphone will be available with no-cost EMI option. To remember, Apple India is also offering iPhone XR with a price cut down as well as with cashback offers for the customers of HDFC Bank. During the Fab Phones Fest, the smartphone will be available with the “lowest price ever”. Along with no-cost EMI option, the iPhone XR will also get offers via Bajaj Finance and HDFC Bank. The Honor Play will also come with a discount price at Rs 13,999 while the original price is Rs 19,999. The Honor 8X will be available at Rs 12,999 during the three days sale, i.e. Rs 2,000 less than the original price tag. The e-commerce website is offering the Honor 8C at just Rs 8,999. While the original price of the smartphone is Rs 11,999. The Honor 7C from the price tag of Rs 9,999 will go down to Rs 8,499 during the Fab Phones Fest sale. The Amazon Fab Phone Fest sale offers best discounts on the Oppo smartphone. The discounted price has not yet been revealed. The Realme U1 will be available with no-cost EMI options and other discounts along with the smartphones- Oppo F9 Pro, Vivo V15 Pro, and Oppo F11 Pro. The Vivo Y83 Pro will come with the "lowest price ever" and can also be grabbed with no-cost EMI options. During the three days sale, the Huawei Mate 20 Pro will get an extra exchange discount. The Huawei Y9 2019 is also in the list but the discounts and offers have not yet been revealed. The Nokia 8.1 will get no-cost EMI options and an Amazon Pay cashback offer. The price cut down is still underwrap. During the three days sale, the e-commerce website will give up to Rs 9,000 exchange discount along with an extra 6 percent exchange discount of old phones via Cashify. The customers will also get 10 percent instant cashback if purchased via HDFC cards and EMI options. There will be discounts on mobile accessories also which includes power banks, cases, chargers, headphones, and selfie sticks except others. 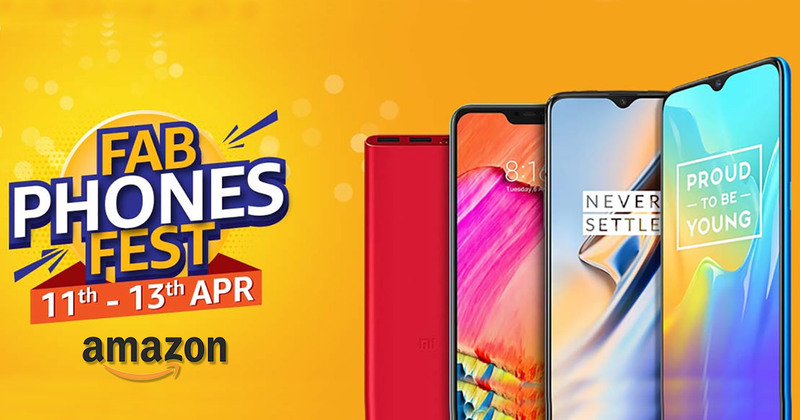 Stay connected with SAGMart to know more about the Amazon “Fab Phones Fest” sale.